Infusionsoft makes it easy to manage all of a contact’s campaign activity from a single spot. The campaigns tab on the contact record will show you the sequence activity for the individual campaign. You can see up to 25 completed campaign items from the past 30 days, and upcoming campaign items that will take place in the near future. To access this section, pull up a contact in Infusionsoft, scroll down, and click the Campaigns tab. Click the Campaigns tab in the bottom row of tabs. If the contact has had campaign activity, it will show up under Recent Campaign History. From here you can see the order that different campaign events took place. You can also resend campaign emails and reapply tags. This is great for testing a new campaign or if a contact says they didn’t receive a specific email. If the contact has upcoming campaign activity, it will show up under Upcoming Campaign Items. From here you can see the different campaign events that are scheduled for this contact. You can preview an upcoming email, send an email or apply tags early, or cancel events that you no longer want to run. Again, this is great for testing a campaign, or canceling campaign events that are no longer relevant to a contact. That’s it! 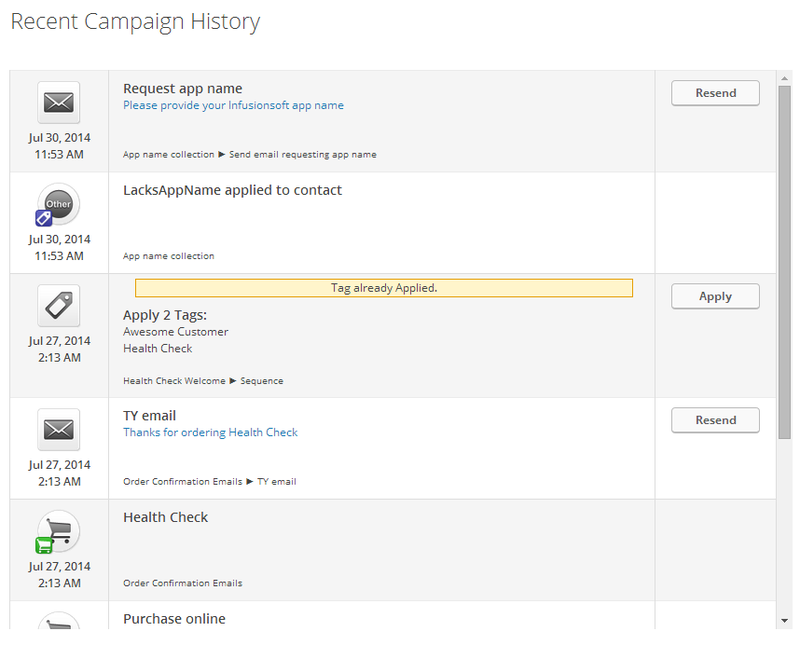 Now you can easily manage your contact’s campaign activity from a single spot.